We got an exclusive preview of the Bass Station II’s new Aphex-centric update ahead of launch, which gave us enough time to explore a few highlights of the update. Unsurprisingly, the new features are great for a bit of leftfield creativity. Step 1: Let’s start with a fairly percussive sound. Load up preset 20 from the BSII’s factory sounds. This gives us punchy, percussive bass that provides a nice starting point to play around with. Let’s leave this sound unedited on the keyboard’s low C. This gives us a subby, almost kick-like bass sound. Step 2: The new overlay function lets us edit the synth’s sound for each note of the keyboard. This is done by holding down a key and making parameter changes. First though, we need to load up an empty overlay. Do this by holding Function then pressing Arp-Swing twice. Change the setting to o5, to load an empty slot. Step 3: Let’s edit the next white key (low D). First, hold down the key and change the range of both oscillators to 2’. We’ve now got a higher percussive sound on this note. Still holding down the D, raise the filter cutoff to around mid way and edit the Amp Env to have a very short decay and zero sustain. Step 4: On the next white key up (low E), let’s use the noise source to create a more ‘fizzy’ perc sound. Holding down this key, turn all the oscillators to zero in the mixer, and raise the noise level to max. We’ll also need to raise the filter cutoff to around three quarters open and turn off any filter modulation from the envelope. With the E still held, play around with the amp envelope to tailor the noise perc sound. A slightly softened attack with short decay and release times, plus low sustain level, works well for a fizzy hat-like sound. A bit of distortion works nicely here too. Step 5: Let’s make something a little harsher sounding on the next white key (low F). Again, hold down the key and turn all oscillators and the noise source down to zero in the mixer. Now raise filter resonance to max so that the filter self oscillates. Remove any filter modulation. We can use the cutoff knob to tune the oscillating filter to a pitch that works nicely with the rest of our perc sounds. Step 6: Finally, let’s add something a little weirder on the low G. Hold down the note and repeat set 5 to create another self oscillating filter perc. Tune it a little higher than last time, so it works well with the previous sound. Now, with the key still held, raise the amp sustain and release time, to create an elongated perc sound. Let’s add some modulation to this! 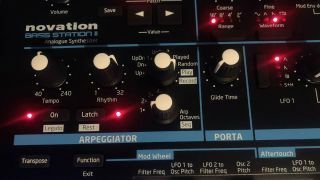 Introduce some filter modulation from LFO 2 to get the pitch of our oscillating filter modulating. Play around with the rate of LFO 2 – a fairly rapid LFO with a little delay at the start sound great here. Now we’ve got a basic five sound perc kit. We can save this overlay if we’d like – press Function then Arp-Swing twice and hit save. Step 7: Now comes the fun part. Let’s use the sequencer to create a drum groove. Put the sequencer into Record mode. Manually input 16 notes, using our five drum sounds in an order you like. Now put the sequencer into Play mode, press On and Latch and press low C on the keyboard. Behold your new drum sequence. Try out the BSII’s range of preset rhythms to create a range of different drum groove. Now start tweaking parameters on the fly for some proper Aphex-style glitchiness. Distortion and Osc Filter Mod are great for this, but go to town with whatever works! We’ve added a little reverb to our audio example in our DAW for a final finishing touch.